Bangladeshi firefighters work to extinguish a blaze in an office building in Dhaka Thursday. The large and deadly fire — the latest in a string of such disasters in the city — forced people to try to climb down to safety. 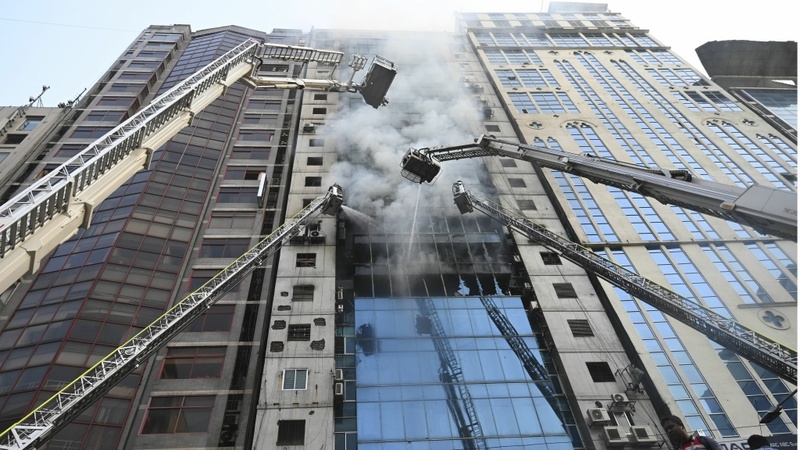 Firefighters battled a blaze in a high-rise office building Thursday in Dhaka, Bangladesh's capital, where dozens of people were trapped by flames and smoke. In a dramatic moment, some of those inside used ropes or cables to climb down, in a desperate effort save themselves. "We have so far confirmed death of six people in the fire," SM Mostak Ahmed, deputy commissioner of the Dhaka Metropolitan Police said, according to the Daily Star newspaper. At least one person was seen falling from the building, as a large crowd watched the tragic scenes from the street below. "Military helicopters and at least 19 firefighting units are part of the rescue operation," Sushmita Pathak reports from Chennai for NPR's Newscast unit. "Just last month, at least 70 people were killed in a major fire in another part of Dhaka." The fire started on the sixth or seventh floor shortly before 1 p.m. local time, according to the Dhaka Tribune, which cites Fire Service spokesperson Ataur Rahman. Fire officials said most of the people who had been trapped inside were rescued within several hours. "The situation is under control," Fire Service and Civil Defense deputy director Debashish Bardhan told the Associated Press. The blaze sent smoke through the building — leading Shajuti Swarna, who was in an office high above the street when the fire broke out, to publish a video on Facebook, asking for help in getting out. Her footage shows office workers holding cloths to their faces to breathe, moving away from cubicles and windows and toward the building's interior. The building, the Banani FR Tower, has variously been reported to have between 19 and 21 stories. Large parts of its glass facade were broken by the fire — and by firefighters, hoping to draw smoke and gases out of the building. In one video, the fire could be seen burning on at least three floors.